Are you a busy pet parent with a hectic schedule that leaves you with less time than you would like to have with your pet? Do you have to be away from home frequently and have to rely on pet-sitters to feed your dog? Are you concerned that your pets may not be getting the proper amount of nutrients in your absence? Automated technology can help to ease your mind. You can get an automatic pet feeder and program it to dole out set portions of dog food to your dog at the time of your selection. You can also record your own voice, calling your dog to come and eat as you usually do when you are at home, so that your pet won’t miss you too much and will know that their meals are still being served on schedule. Some dogs refuse to eat if their pet parents are not around, and hearing your voice can comfort them and encourage them to finish their food. An automatic dog feeder is a food dispenser for dogs and works either on electricity or gravity. It has a food container that you can fill up with the dog food of your choice. The feeder then metes out this food into a food bowl for your dog to eat. If you have a gravity-operated dog feeder, a serving of food is dispensed only after the earlier serving in the bowl has been finished. 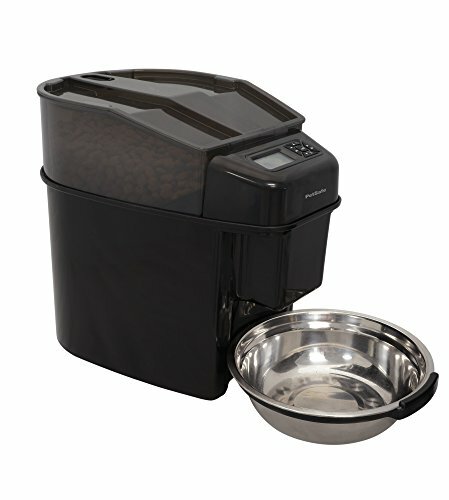 If you have an electronic dog feeder, you can program it to serve a certain amount and type of food at a certain time. 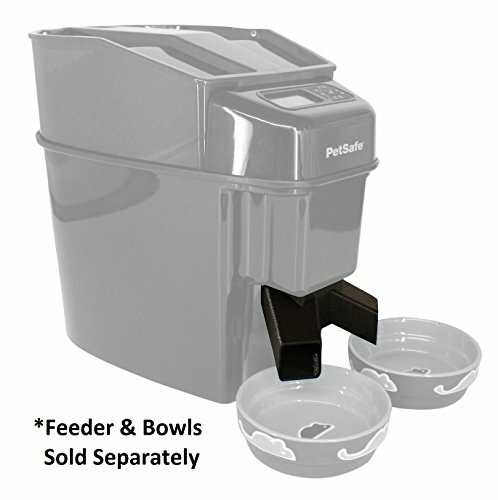 As mentioned, an automatic dog feeder can be a boon to busy pet parents. If you have to be away from home or even when you are at home, you can set up an automatic dog feeder and be easy in your mind that your dog is going to get fed at the right time. 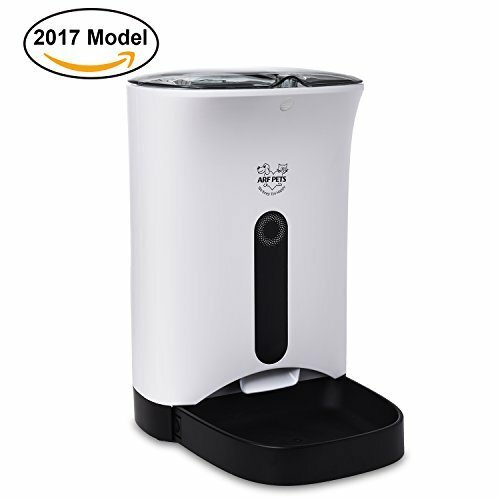 Elderly pet parents and disabled pet parents will find an automatic dog feeder convenient as it can save them from having to get up and get the food every time they need to feed their dog. 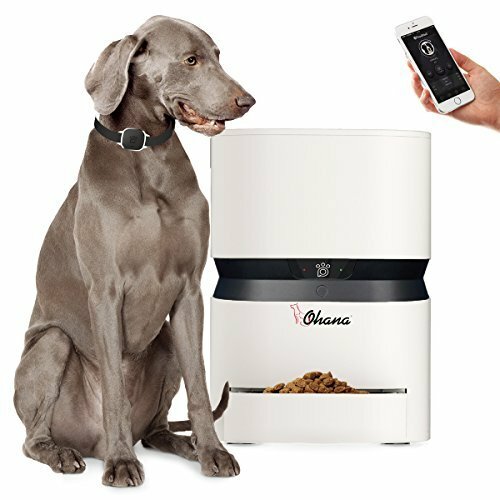 With an automatic dog feeder, you can regulate the amount of food you want your dog to eat at a particular time. So there will be no question of your dog over-eating and becoming overweight as a result. You can select the type of dry, moist, or semi-moist dog food you want to feed your dog and load that up in the dog feeder container. Since the meals can be spaced out at set times, your dog can have the chance to digest a meal properly before the next scheduled feeding, causing fewer cases of your dog vomiting half-digested food. Most of us live with dogs for their companionship, and this factor shouldn’t get overlooked in all the conveniences provided by new technologies. Take care that feeding your dog doesn’t become a chore assigned to a machine. When you are at home, feed your dog yourself and let mealtimes become happy, bonding events. Power cuts frequently happen in many areas, and if your automatic dog feeder doesn’t have a battery backup, your dog may miss out on their meals when the electricity is gone. Electronic dog feeders are popular with many pet parents as these feeders can be programmed to dole out a certain amount of food at a specified time. This ensures that your dog will not miss out on any of their meals and will not overeat. The advantage of this is obvious, your dog will avoid the risk of obesity and eating small portions at regular intervals will benefit their digestive system. The negative aspect is that electronic dog feeders are dependent on electricity and programming, and power outages and programming glitches can mess up your and your pet’s meal schedule. Yes, some automatic dog feeders do work on backup batteries, but batteries can run out too. This can be hugely problematic if you are away and are dependent on the electronic dog feeder to feed your pet. Whether you pick a gravity dog feeder or an electronic dog feeder, it is advisable to always have someone check on your pet while you are away. Never leave your dog completely alone for extended periods of time. The main feature of an automatic dog feeder, of course, is its ability to dispense food automatically, either by a gravity-operated process or an electronically-operated process. Having the feeder dispense food to the dog can be time-saving and convenient for many pet parents. Some automatic dog feeders contain multiple trays that you can fill up with dry, semi-moist, and moist food, and which you can program with a timer to be dispensed at the time of your choice. Some automatic dog feeders allow you to adjust the rate at which the food is dispensed. This is good news for pet parents with over-eager dogs that have the tendency to lunge for the food the minute it appears. They will have to slow down and wait for the food, and you won’t have to worry about them choking on the food in their haste or getting indigestion from eating too quickly. Some automatic dog feeders can be programmed with your smartphone or via your computer. Of course, you will still need to be around to fill the container with dog food. 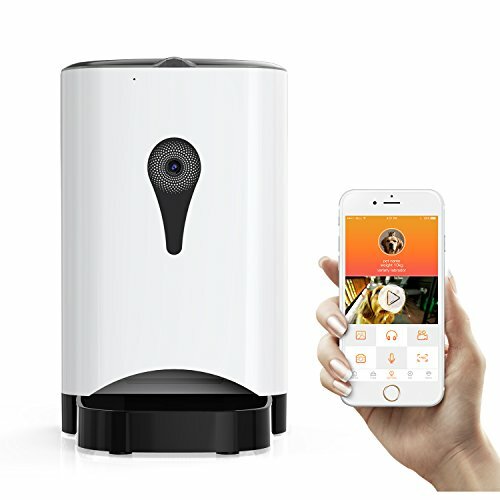 Some automatic dog feeders have installed cameras and voice devices, so that, if you are away, you can still watch your pet eat and talk to them while they are eating. How often are you going to use the automatic dog feeder? 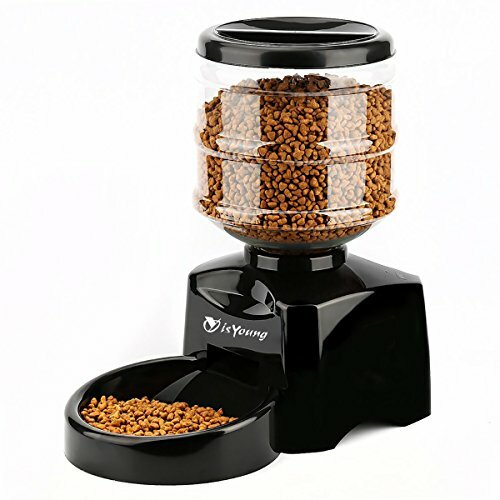 If you are going to make frequent use of the feeder, you may want to get one that accommodates a larger amount of dog food. Some containers can store dog food supply for several weeks. 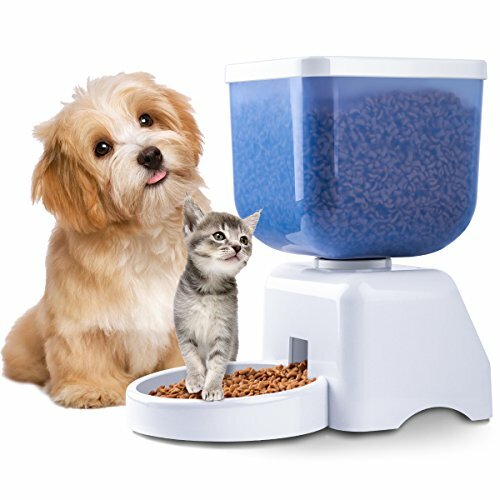 What will be more convenient for you, a gravity operated dog feeder or an electronic dog feeder? 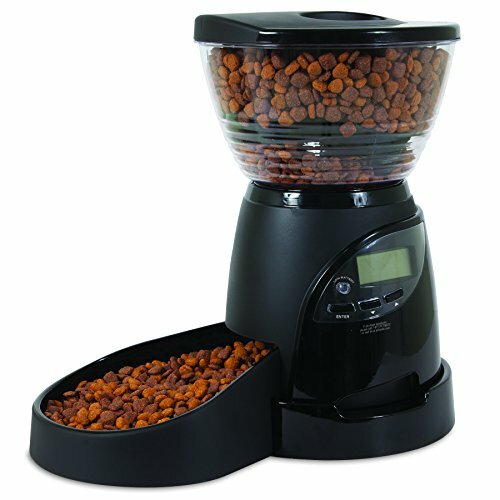 An electronic dog feeder has more features that a gravity dog feeder. What is your budget for the dog feeder? Gravity dog feeders, since they are simpler, are less expensive than electronic dog feeders. Is the automatic dog feeder made of durable materials? Some dogs, once they realize that the food is in the container, may try to speed up the dispensing process by gnawing open the container itself. Are you able to easily program the dog feeder to the feeding schedule, the dog food type, and the dog food portion you want to set up for your pet? 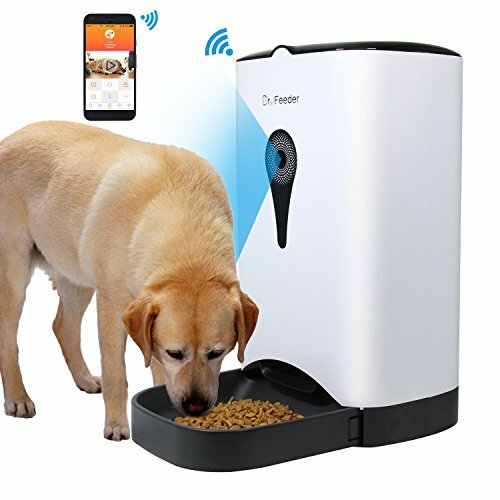 Does the dog feeder have extra features such as a camera, a voice device, and other useful apps? Most dogs are creatures of habit and are happier if you keep them on a schedule. After a few practice runs, they will quickly pick up what the dog feeder is there for, and will make tracks for it whenever it is time for their next meal. You may even find them loitering around the feeder a good while earlier, hoping their presence will get the machine to cough up. For such eager beavers, an electronic feeder is the best option; they are likely to never depart from gravity feeders until the entire container is emptied. Ideally, if you are a pet parent, you want to be around at meal times to feed your pet yourself, but busy work lives and work schedules can often run interference with this. Having an automatic dog feeder that can be relied upon to feed your dog their meals on time can alleviate your concerns to a great extent. You don’t have to worry about your dog going hungry while you’re away, and your pet doesn’t suffer the anxiety of wondering when their next meal is coming.